Trace Cyrus, an American musician who is also the son of country singer Billy Ray Cyrus and brother of the famous singer Miley Cyrus, is known for his role in the rock band Metro Station as a bassist. 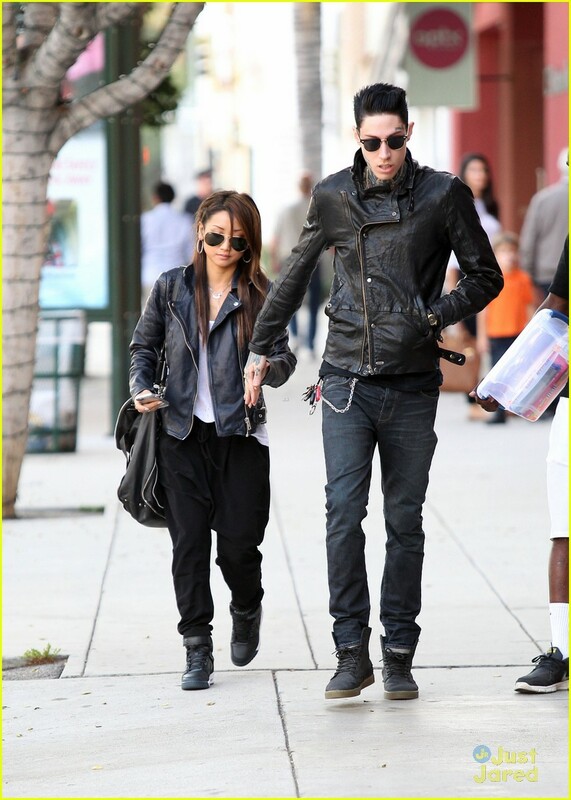 Trace, who owns the clothing company From Backseats to Bedrooms, became a controversial figure after the issue of the fake pregnancy with his girlfriend Brenda Song emerged. The on-and-off relationship with Brenda is not a new issue for those following them as they have gone through it earlier. There was a time when rumors went as far as to suggest that Trace had married Brenda. But everyone is curious to know if Trace is dating Brenda after the incident. 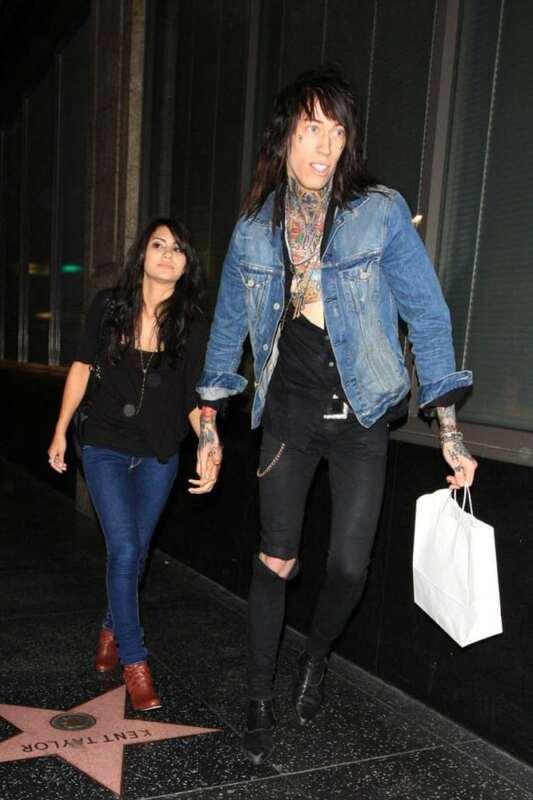 Let's unravel Trace Cyrus's complicated relationship with Brenda Song. Trace and Brend were once so deep in love that marriage was just around the corner for the couple. They gave a news of their engagement on October 14, 2011. Trace posted about his official engagement on his Twitter and Miley excitedly replied to the tweet. Here is the tweet, have a look. But the couple split in June 2012, with trace announcing the mishap. But they were soon rumored to be together and Brenda was even rumored to be pregnant with Trace. But they separated again, this time around in April 2013. It was Brenda who twitted about the split. Now it's just a flashback, come back, cause I want you bad. The reason for their second split, however, is yet to be disclosed. But they were reported to have indulged behind each other's back. 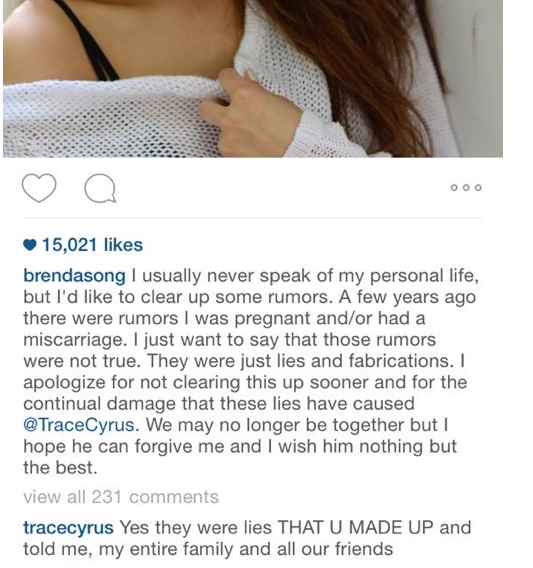 In March 2014, it was reported that Song had removed all the photos of Trace from her Instagram. In 2015, Brenda posted an apology for the pregnancy issue. Trace did appreciate Brenda's decision, but the relationship was done for. Since then the couple has not reported being dating officially. Well given the complicated relationship of the two, people have pointed out that the couple's marriage rumors might have been as false as the pregnancy rumors. Trace, on his interview with Alternative Press, cleared the rumors about his marriage. However, he said that their engagement was true. As real as the video feels, obviously Brenda and I didn't get really married during the shoot. But Brenda was not Trace's first girlfriend. Prior to her, he was in a relationship with Demi Lovato until July 21, 2009. The reason for the split was said to be their age difference.Trace was also in a relationship with Henna Merjos from 2005 to 2008. Well, we have talked at length about his past. But who is he dating now? Scroll down to know more. Trace has moved on with his life after leaving Brenda. And yes, he has found a new love. He is in a relationship with a girl named Melissa Marie. Trace and Melissa seem to be deeply in love with one another. In fact, Trace even went ahead to share a romantic moment with Melissa on his social media in October. Seems like Trace, whose net worth is around $2 million as of 2017, has finally found someone to share his life and wealth with. Let's wish the couple all the best. Stay tuned for updates.